Stir- up Sunday has been and gone, but if you like many others didn’t manage to get stirring over the weekend, there’s still time! This week has been Christmas cake week at the Pumpkin Patch! 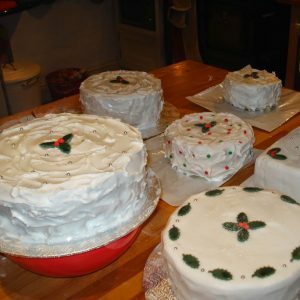 Many of the regulars at the Pumpkin Patch have now weighed out, chopped and peeled, measured and stirred up a Christmas cake. It’s not as difficult or as time consuming as you may think. It does take a little organisation to ensure that you have all the ingredients, but from then on it’s pretty straight forward. Usually, I’m one for throwing in a bit of this and a bit of that, and of not paying much attention to recipes. In making a Christmas cake however, a little attention to detail is required. Leave out a few vital ingredients and your cake may become a door stop or just outright miserable! I always recommend that you weigh everything out in advance, that way as you work your way through the recipe, nothing is left out or forgotten. Once the ingredients are weighed, you can methodically set about making the cake, but don’t forget to soak the dried fruit in a little brandy overnight. If you don’t want to use brandy, soak your dried fruit in some cold tea! Sound odd, but a traditional Welsh ‘barabrith’ calls for just that – cold tea. It works well and adds plenty of moisture back into the dried fruit, which in turn makes a lovely moist cake. If you forget to soak the fruit, the fruit will swell and absorb the moisture from your cake, and leave the cake dry and crumbly. Mix the cake early enough in the day, or early evening, as it takes up to four hours to cook! So, if you pop it in the oven at 9pm, you’re in for a late night! 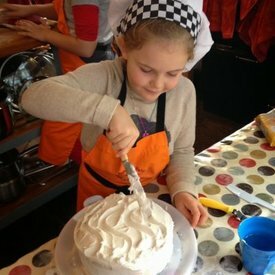 I use a stand mixer, but the children in my classes don’t. A large bowl and strong wooden spoon works well, combined with a bit of muscle power, and a lot of hard work! To make life easier, line a cake tin with lining paper or grease proof paper before you start mixing, that way the awkward fiddly bit is out of the way. Simply use a pastry brush and a small bowl full of oil to brush inside the tin before you place the paper inside, this keeps the lining paper in place and makes the job considerably easier. Once the cake mixture is in the tin, trim the lining paper to the height of the tin and cover the top with more paper. For the past few years I’ve used foil baked parchment paper available in supermarkets to cover the top, it does the job, and stays in place whilst cooking. Why cover the top? Well, it prevents the cake from drying out and also stops the top from browning too much during the long cooking time. Keep the oven to a cool 140°C and just check it after about 3 ½ hours, just in case! This is a lovely easy recipe for a dark moist, fruity cake. When it’s cooled, wrap it in more greaseproof paper and foil or keep it in an air tight tin. Feed it a little brandy on a regular basis for a boozy cake, and decorate it with candied fruit and apricot jam, or with traditional marzipan and icing. Good luck and have fun. 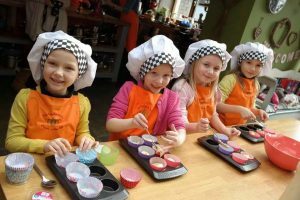 If you don’t think you’ll find the time to get baking this year, don’t worry send one of the children along to the Pumpkin Patch Christmas Make & Bake sessions!